The potential for nuclear war remains as present today as it was during the Cold War, with United States and Russian relations on a shaky footing, tensions between India and Pakistan and the Korean Peninsula tense. The World Council of Churches WCC has joined other faith groups in New York to issue a call that governments should capitalize on years of growing concern and negotiate a ban on nuclear weapons next year. The inter-religious call was made at the United Nations on Oct. 12 where the message pointed out that despite the decades-old U.N. charter the world is not a safer place due to arms proliferation. Article 26 of the U.N. Charter, singed in 1945, envisages the "establishment and maintenance of international peace and security with the least diversion for armaments of the world's human and economic resources." In the decades since the adoption of the charter, however, the world has diverted immense stores of material, economic, technical and intellectual resources to the production and maintenance of "a vast and growing array of armaments." "Far from ensuring peace and security, these preparations for war and violence have locked states into the 'security dilemma' of escalating mistrust and fear. "They have inflamed and entrenched conflicts throughout world, bringing unimaginable suffering to vast numbers of people," said the faith communities. 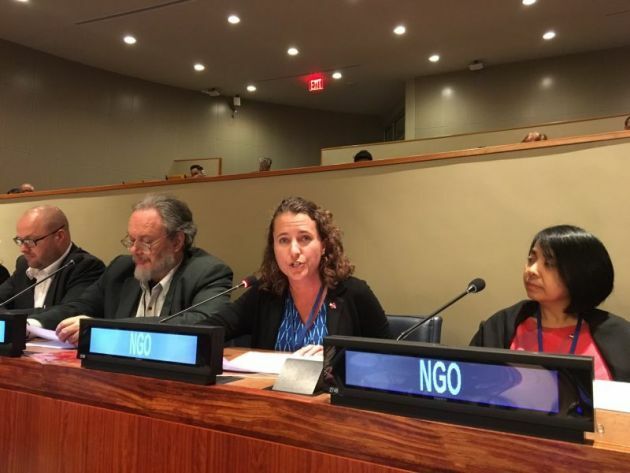 Speaking on behalf of Christian, Buddhist and Muslim organizations, Dr. Emily Welty urged delegates to "negotiate a legally-binding instrument prohibiting nuclear weapons." A resolution calling for such a treaty next year was introduced at the disarmament committee of the UN General Assembly, the day she spoke. Welty is vice-moderator of the WCC Commission of the Churches on International Affairs. Nuclear weapons are "incompatible with the values upheld by our respective faith tradition - the right of people to live in dignity; the commands of conscience and justice; the duty to protect the vulnerable and to safeguard the planet for future generations," the joint statement said. Nuclear weapons are lethal technologies which have been developed without regard for the public conscience and the rule of law, Welty said. They are "the pinnacle of humanity's self-destructive potential". The inter-faith statement was issued by Pax Christi International, Maryknoll Fathers and Brothers, Soka Gakkai International and other groups as well as the WCC.